Something startling here. It appears that the whole crust shifted thirty degrees around 120,000,000 years ago. Thus my conjecture regarding the Pleistocene Nonconformity does have a real precedent in time in space. The shift was also the correct thirty degrees as was the one that occurred 13,000 years ago. Since I have been arguing for the recent shift been deliberate, I knew that there had to be a precedent to work from in order to attempt such a stunt. I presumed that it had been closer in time but this is much better. It clearly asks the right questions and suggests that it can be done again. We will be reaching those same conclusions over the next few years. I have also proposed in this blog a plausible alternative explanation for crustal magnetism that conforms nicely to the available evidence. The explanation presented here flies in the face of all the evidence and is mostly hand waving comparable to theories of land bridges from sixty years ago. It is known that the Earth's magnetic field is produced by convection currents of an electrically conducting iron-nickel alloying the liquid core, about 3,000 kilometers below the earth's surface. The geomagnetic field is highly variable, there are changes in Earth's magnetic field on a multitude of spatial and temporal scales. On a time scale of tens to hundreds of millions of years, the geomagnetic field may be influenced by currents in the mantle. 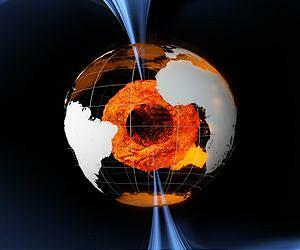 The frequent polarity reversals of Earth's magneticfield can also be connected with processes in the mantle. These are the research results presented by a group of geoscientists in the new advance edition of "Nature Geoscience" on Sunday, July 29th. The results show how the rapid processes in the outer core, which flows at rates of up to about one millimeter per second, are coupled with the processes in the mantle, which occur more in the velocity range of centimeters per year. The international group of scientists led by A. Biggin of the University of Liverpool included members of the GFZ German Research Centre for Geosciences, the IPGP Paris, the universities of Oslo and Utrecht, and other partners. Above the liquid outer core is the mantle, the rock in which behaves plastically deformable due to the intense heat and high pressure. At the boundary between Earth's core and mantle at 2900 km depth there is an intense heat exchange, which is on the one hand directed from the Earth's core into the mantle. On the other hand, processes within Earth's mantle in turn also affect the heat flow. The interesting question is how the much slower flow in the solid mantle influences the heat flow and its spatial distribution at the core-mantle boundary, and how this will affect the Earth's magnetic field which is produced due to the much faster currents in the Earth's core. "The key variable is the heat flow. A cooler mantle accelerates the flow of heat from the hot core of the Earth, and in this way alters the also heat-driven convection in the Earth's core", said Bernhard Steinberger of the GFZ German Research Centre for Geosciences. "Ocean floor sinking into the mantle due to tectonic processes can lead to cooling in the mantle. They cause at these sites an increased heat flow into the cooler parts, namely until they have been heated to the ambient temperature." That might take several hundred million years, however. Conversely, the hot core of the Earth leads to the ascent of heated rocks in form of large bubbles, so-called mantle plumes that separate from the core-mantle boundary and make their way up to the surface of the earth. This is how Hawaii came into existence. This increases the local heat flux out of the earth's core and in turn modifies the generator of the geomagnetic field. In the Earth's history, polarity reversals of the geomagnetic field are nothing extraordinary. The most recent took place only 780 000 years ago, geologically speaking a very short period of time. The research team was able to determine that in the period of 200 to 80 million years before present, reversals initially happened more often, namely up to ten times in hundred million years. "Surprisingly, these reversals stopped about 120 million years ago and were absent for nearly 40 million years," explains GFZ scientist Sachs. Scientists presume that the reason for this is a concurrent reorientation of the whole mantle and crust with a shift in the geographic and magnetic poles of about 30 degrees. Known as "true polar wander", this process is caused by a change in density distribution in the mantle. If it increases the heat flux in equatorial regions, it would presumably lead to more frequent field reversals, if it decreases it, the field reversal might not occur.